A man who rushed to alert his neighbors to danger despite being on fire himself has died from his injuries, a local business owner reports. Valerij Alyohin, 33, was a resident of the Emerald Shores Apartments in El Lago, which caught fire on Saturday, Feb. 26. With his clothes on fire, Alyohin rushed from one apartment to the next, helping his neighbors escape the flames, which destroyed 36 apartment units. He was the only person injured in the fire, with burns covering 80 percent of his body. Alyohin died from his injuries at about 5 p.m. Sunday, March 13, said Rusty Cates, owner of Coffee Oasis on NASA Road 1. If it wasnt for Alyohin, Chris Williams told The Citizen recently that he might not have made it out of his apartment in time. He and his girlfriend were woken up by Alyohin, who banged on everyones door after the fire started in another neighbors apartment. Another resident, Lisa, who didnt want to disclose her last name, said what is more important is what her friend did  Valerij Alyohin. 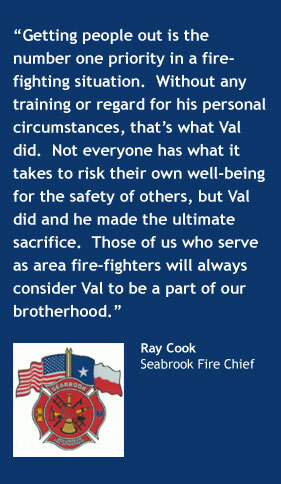 She said Val ran from door to door to warn residents, even when he was on fire. She said it took a lot of convincing from others for him to finally jump in the pool to extinguish the fire, because he wanted to warn as many people as possible. Nearly 40 unites were destroyed in the fire and more than 80 residents displaced. A small extemporaneous memorial to Val was created around a tree planter next to the complex's community pool and near where Val's apartment unit was located. Photos of Val are prominently placed in the complex's temporary office location.